If you're scouting for a casual yet absolutely stylish look, choose a grey oversized sweater and Dsquared2 cropped cigarette trousers. As well as totally comfortable, these two pieces look great paired together. A pair of white low top sneakers will be a welcome addition to your outfit. 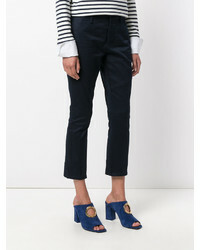 If you're after a casual yet stylish outfit, rock a navy blazer with Dsquared2 cropped cigarette trousers. As well as very comfy, these pieces look stunning together. White and black leather low top sneakers will add a more relaxed feel to your look. If you're after a casual yet absolutely chic look, reach for a navy blazer and navy dress pants. These items are super comfortable and will look great when worn together. For something more on the daring side to complete this ensemble, rock a pair of white and black horizontal striped low top sneakers. For a casually elegant getup, consider wearing a red button down blouse and Dsquared2 cropped cigarette trousers — these two items go really well together. Choose a pair of navy athletic shoes to make the look current. For a smart casual outfit, consider pairing a grey trenchcoat with Dsquared2 cropped cigarette trousers — these two pieces a work setting well together. Break up your ensemble with more casual footwear, like this pair of red leather high top sneakers. 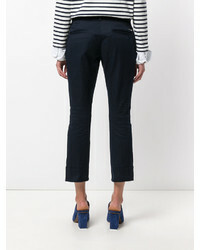 For a casual chic outfit, wear a navy coat with Dsquared2 cropped cigarette trousers from farfetch.com — these pieces fit nicely together. For the maximum chicness rock a pair of silver leather pumps. 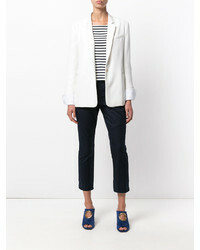 If you're hunting for a casual yet absolutely chic ensemble, wear a navy blazer with Dsquared2 cropped cigarette trousers. These items are super comfy and will look amazing paired together. For something more on the daring side to complement this outfit, choose a pair of white low top sneakers. For a casually elegant outfit, try pairing a white button down blouse with Dsquared2 cropped cigarette trousers — these two items go nicely together. When it comes to footwear, this look is finished off wonderfully with silver leather pumps. For a cool-meets-stylish look, wear a beige trenchcoat with navy dress pants — these two pieces go really well together. When it comes to shoes, this ensemble is round off nicely with white and black leather platform loafers.